Scientists are finding galaxies billions of light years away from Earth, yet there are still discoveries to be made right next door. In January, data from the Dark Energy Survey — which utilizes an 8,000-pound camera mounted on an equally powerful telescope in the Andes Mountains to see deep into space — revealed 11 previously unknown stellar streams orbiting the Milky Way galaxy. Stellar streams mostly reside on the outskirts (or “halo”) of the Milky Way, and they represent remnants of dwarf galaxies and star clusters that passed by the galaxy too closely and got torn apart by its gravitational pull. Only about 20 stellar streams had been identified in the Milky Way before this discovery, and locating so many at once is unprecedented, said Annika Peter, faculty member at Ohio State’s Center for Cosmology and AstroParticle Physics (CCAPP), which is a key collaborator in the Dark Energy Survey(DES). “The fact that we found so many streams so close together is surprising, and it tells us that, actually, the Milky Way has munched up quite a lot of these little galaxies over time,” said Peter, who is also a professor in the Departments of Astronomy and Physics. This lends credence to astronomers’ belief that galaxies are formed from small galaxy building blocks over time, said Paul Martini, professor of astronomy and a member of CCAPP. “The stellar streams are relics of some of these building blocks,” and can provide a sort of fossil record for the Milky Way’s evolutionary history, he said. In addition to clues about where these stars came from, follow-up measurements will help researchers build a better model of the distribution of dark matter in the Milky Way’s halo, Peter said. 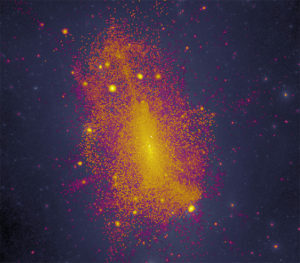 “The orbits of these stars are really sensitive to dark matter,” she said, adding that some people are looking for “stream gaps” for evidence of smaller, starless dark matter halos in the Milky Way. These types of discoveries are made possible with the enormous data sets produced by large-scale astronomical surveys like DES, though it’s “analogous to searching for a needle in a haystack,” Martini said.